The lingering hot summer days are the perfect excuse to turn your outdoor space into an alfresco extension of your home. The garden is no longer a place for pathetic patio furniture and basic barbeque stands. Innovative designs and trends has given outdoor living a fresh makeover and a very grown up feel and we can’t wait to embrace it all. Outdoor living spaces have transformed into replicas of interior living spaces featuring a whole range of aesthetics in durable finishes designed specifically for outdoor use. Luxurious melamine picnicware, ditsy printed napkins, delicately scented candles and comfy plush cushions together with intricately patterned vases displaying rustic bouquets of home grown flowers are now everyday features in the garden. Patio areas are more commonly being decorated in mosaic tiles to create a Mediterranean ambience. Choosing clean and uncomplicated designs will ensure your outdoor interiors remain on trend for seasons to come. It is becoming much more fashionable to entertain at home and the lingering summer days are the perfect opportunity to enjoy special times with family and friends in the privacy of your own pretty little outdoor haven. 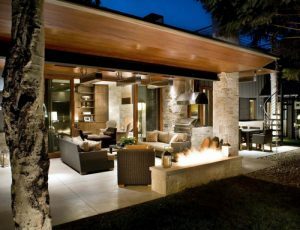 Investing in items such as a firepit, elegant chimnea or a perfectly positioned patio heater means even on much cooler evenings, you can still take advantage of the night air and chilled out holiday feeling that socializing outside evokes. Adding a few cosy outdoor throws will prolong the use of the garden and beautiful furniture, long after the summer nights have passed. Outdoor furniture continues to adopt a very summerhouse feel to it with the most beautifully crafted ranges including aluminum and resin weave. Modular casual dining sets are very on trend and give the feeling of being indoors, seated beside the lounge coffee table. Cooking outside has never been more enjoyable with state of the art charcoal and gas barbeques and Firebox ovens allowing foodies to cook up delicious homemade platters and pizzas in their custom designed outdoor space. The Firebox is also portable and can easily be transported if you are planning to visit friends and family. Lighting can create an atmospheric mood to your outdoor living space, regardless of how large or small an area you have to work with. Pretty twinkling fairy lights entwined in trees and bushes will offer a dazzling shimmer of light to your evening. Beautifully glass blown crystal balls are another very pretty way to light up your outdoor space. These solar powered decorations can be pressed into the ground and create a glittering show of light all around the garden. Taking their charge from the strong day sunshine means you do not have to worry about batteries and cables. Outdoor free standing ornaments are also a wonderful way of adding a little fun and drama to being outdoors. 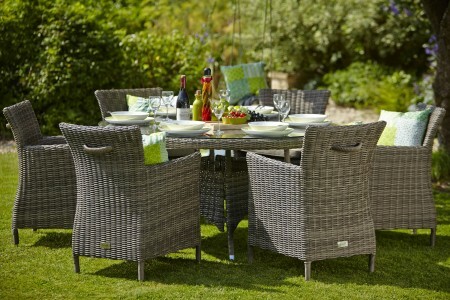 Why not pop along and take a closer look at our extensive range of outdoor living merchandise ranging from barbeques, furniture, lighting, cushions, candles and ornaments that can help turn your garden into a superb summer sanctuary for everyone to enjoy. We also have an excellent range of furniture covers to keep your beautiful furniture looking tip top.